The Dock at the bottom of the homescreen of the iPad has always been a great way to easily access your favorite apps. In iOS 11 and iOS 12, the Dock is much more powerful. It still lets you launch apps, but now you can access it from every app and use it to multitask. Read on to learn all about how to use the Dock in iOS 11 and iOS 12. Simply swipe up from the bottom of the screen (on earlier versions of the iOS, this was used to reveal Control Center). If you're using an external keyboard with your iPad, you can bring up the dock by clicking Command (or ⌘) + Option + D at the same time. If you're using the iPad Pro models (or any other iPad models) that don't have a home button, the swipe-up gesture that reveals the Dock is similar to the one that takes you back to the homescreen. Use a short swipe up to reveal the dock; use a longer swipe to go back home. To learn more about the gestures that replace the home button, read iPhone X Home Button Basics. Since the Dock is used for launching apps, you'll probably want to keep your most-used apps there for easy access. 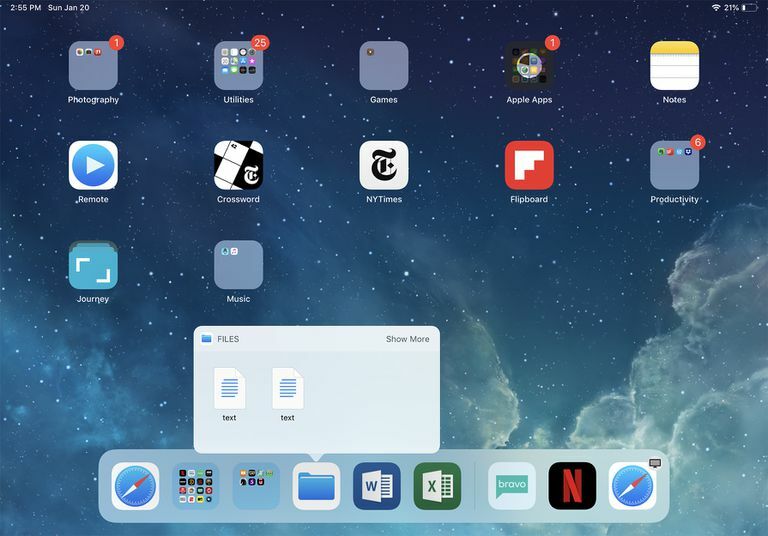 On iPads with 9.7- and 10.5-inch screens, and the 11-inch iPad Pro, you can put up to 13 apps in your Dock. On the iPad Pro, you can add up to 15 apps thanks to the 12.9-inch screen. The iPad mini, with its smaller screen, accommodates up to 11 apps. Tap and hold the app that you want to move. On iOS 11, keep holding until all the apps on the screen begin to shake. On iOS 12, wait for the app icon to gray out slightly. Drag the app down into the dock. Click the Home button to save the new arrangement of apps. On iPads that don't have a home button, the new arrangement is saved as soon as you release the app into the Dock. Tap and hold the app you want to take out of the Dock until it starts shaking (on iOS 11) or grays out (on iOS 12). Drag the app out of the Dock and into a new position. Click the Home button. Again, on models without a Home button, the new arrangement is saved immediately. Move the Show Suggested and Recent Apps slider to off/white. Tap and hold on the Files app in the Dock. This is tricky; hold too long and the apps start to shake as if they're going to be moved. Let go too quickly and nothing happens. A tap-and-hold of about two second should work. A window pops up that shows up to four recently opened files. Tap one of the files to open it. To view more files, tap Show More. Close the window by tapping elsewhere on the screen. Prior to iOS 11, multitasking on the iPad and iPhone took the form of being able to run some apps, like those that play music, in the background while you do something else in the foreground. In iOS 11 and up, you can view, run, and use two apps at the same time. There are two ways to do this. The first is called Slide Over. Make sure both apps are in the Dock. Open the first app you want to use. While in that app, swipe up to reveal the Dock. Drag the second app out of the Dock towards the center of the screen and then drop it. The second app opens in smaller window at the edge of the screen. Close the Slide Over window by swiping it off the edge of the screen. Drag the second app out of the Dock and towards the left or right edge of the screen. This is just like in Slide Over. With the second app window floating on top, swipe down on the gray line at the top of the second window. This converts the Slide Over window into Split View. With the two apps on the screen, move the divider between them to control how much of the screen each app uses. To return to a single app on the screen, just swipe the divider to one side or the other. The app that you swipe across will close. Open two apps using the steps above. Double click the Home button to bring up the app switcher. Notice that the two apps you just opened the same screen are shown together in this view. When you tap that window, you return to that same state, with both apps open at the same time. This means that you can pair apps that you use together and then switch between those pairs when working on different tasks. Find the content you want to drag to another app and select it. Tap and hold that content so that it becomes moveable. Reveal the Dock by swiping up or using an external keyboard. Drag the selected content onto an app in the Dock and hold the content there until the app opens. Drag the content to the place in the app where you want it, remove your finger from the screen, and the content will be added to the app. You can also drag and drop text when using Split View or Slide Over. Click Command (or ⌘) + Tab at the same time. Move through the list of apps using the left and right arrow keys or by clicking Tab again while still holding down Command. To launch an app, select using the keyboard and then release both keys. Looking for a good read? Apple Books on iOS 12 has it all.